← Gear Up! Dec. 3rd and 5th….Build Your Research Toolkit! You can now access the Red Book Online from the American Academy of Pediatrics on your Apple and Android smartphones and tablets. This important resource provides guidance on manifestations, etiology, epidemiology, diagnosis, and treatment of 200+ childhood conditions. NOTE: You have to be on the College or DHMC network, or VPN or Secure Access (if offsite). Once there, you can sign up for an individual account, which then lets you use the app from offsite. 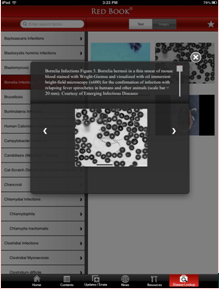 From the Biomedical Libraries web page, Go to eBooks, scroll down to Titles by Subject. 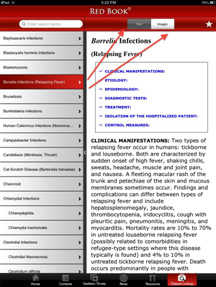 Under Infectious Disease, select Red Book Online. You will get an email shortly after registering. It will give you your AAP ID. Use your AAP ID and the password you created to login to the AAP web site in the future. From the App Store on your Apple device, or from Google Play on your Android device, you can download the Red Book app and login with the above information. The system will ask you to access the site within your organization’s site license at least once during a 120-day span to validate that you are still eligible. A reminder will appear when you log in if you haven’t accessed within 120 days. This entry was posted in New Materials, News Item, Resources. Bookmark the permalink.